Kate Fordham, escaping terrible trauma, has fled to the beautiful sunlit city of Granada, the ancient capital of the Moors in Spain, where she is scraping by with an unfulfilling job in a busy bar. One day in the glorious gardens of the Alhambra, once home to Sultan Abu Abdullah Mohammed, also known as Boabdil, Kate finds a scrap of paper hidden in one of the ancient walls. Upon it, in strange symbols, has been inscribed a message from another age. It has lain undiscovered since before the Fall of Granada in 1492, when the city was surrendered to Queen Isabella and King Ferdinand. Born of love, in a time of danger and desperation, the fragment will be the catalyst that changes Kate’s life forever. 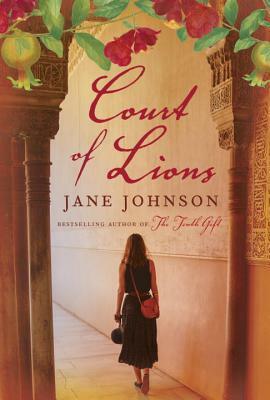 An epic saga of romance and redemption, Court of Lions brings one of the great hinge-points in human history to life, telling the stories of a modern woman and the last Moorish sultan of Granada, as they both move towards their cataclysmic destinies. This was an interesting read. I think it’s the first historical novel I’ve read that also has a current timeline plot connected with it. And while I found the transition back and forth between time periods smooth, I have to admit that I enjoyed the historical plot line more than the contemp plot line. It may be because I don’t read a lot of novels based on historical events that I found that plot so engaging. The writing is so rich in detail that it made the location just pop to life. In fact, to me the location was a character in the book. It was almost like I was there. The description of the places made me want to go there, which is neat, because travel isn’t really my thing. I’m normally not a huge fan of romance, but as I’ve said before if it’s done as part of the story and is done well, then I actually enjoy it. The romance and love in this story was beautifully written, especially in the historical parts of the book. I don’t want to give anything away, but it was quite lovely to read. I really enjoyed Court of Lions and look forward to reading more from this author.